Artist seeks fame and fortune by drawing funny! Radio station Rock103, including cover art for The Wake-Up Crew’s “Best of” Boxed Set, co-creating the latest version of the station’s walrus logo with Greg Cravens. Lin has also painted murals for Pancho’s Restaurant, McDonald’s, the Memphis Moose Lodge Family Center, and Fitzgerald’s Casino (Tunica). In addition, his artwork has also appeared in The Memphis Flyer, Commercial Appeal, Airbrush Action Magazine, Amazing Figure Modeler Magazine, the San Diego Comic Con, Phoenix Comicon and Metropolis Superman Celebration program guides, and on stage and backstage during the Orpheum Theartre’s Annual Auction. Lin was an artist and scare crew member for the Haunted Web of Horrors, a non-profit haunted house that benefits Youth Villages in Memphis. He was named the Memphis Ronald McDonald House‘s Special Events Volunteer of the Year in 2001, and again with RMH ‘A-Team’ and Nightmarez/HauntedWeb.com co-horts Patrick French and Todd Patton in 2002. He was awarded the “Superman Of Metropolis” award at the 2005 Metropolis Superman Celebration and was the Artist Guest Of Honor at ShadowconXIII in 2009 and ShadowconXVI in 2012. He has also won two Memphis Area Radio Stations (M.A.R.S.) awards for writing and voicing radio commercials. He recently was awarded a 2012 President’s Volunteer Service Award by Volunteer Northwest Mississippi, a volunteer center of the Community Foundation of Northwest Mississippi, in conjunction with the President’s Council on Service and Civic Participation and the Corporation for National & Community Service. 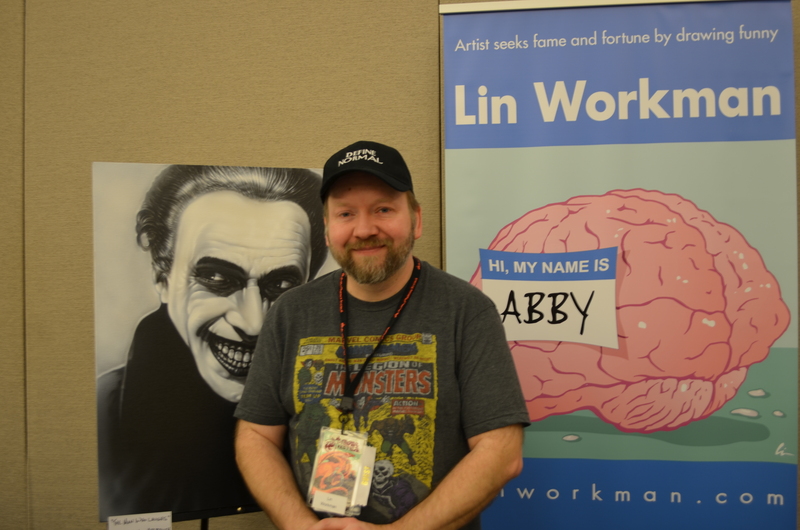 Lin served as the President and Vice-President of the Mid-South Cartoonists Association (MSCA) for 4 years and 9 years, respectively- and was the MSCA‘s assistant webmaster. Lin is also a member of the DeSoto Arts Council and the Memphis Ghostbusters. Lin has participated in several art shows in Memphis and Hernando, including many one man shows featuring his “Monsterpieces”. Lin and co-host Dave Beaty can be heard discussing art and comics on the weekly “Rogues Radio Podcast“. He is married to Nicki Workman, and has three cats- Jarael, Harley Quinn, and Lex. Lin is the third “Lindsay/Lin” in a row in his family, but is only a “Lindsay/Lin Workman, Jr.” Has two nieces named after him- Shena Lin and Lindsay Nicole. Lin was due to be born on Halloween, but as usual he was late. He has the same birthday as actor David Schwimmer from FRIENDS and Eunice Huthart- Angelina Jolie’s stunt-double, and was born the day after his mother’s birthday (yep she was in labor with Lin on her birthday). On his honeymoon he celebrated his 45th birthday by visiting a New Orleans cemetery- hey, it was “Day of the Dead/All Souls Day”. Lin was born in Millington, TN (Justin Timberlake’s home town) as a navy brat. He grew up in Ogden, UT and Memphis, TN and graduated high school from Southaven High School in Southaven, MS (same high school author John Grisham and Lin’s wife Nicki both graduated from). Lin once lived across the street from Graceland, and attended Graceland Jr. High (7th grade) for a year in the late 70’s. Lin’s mom knew Elvis when she was growing up in Memphis. Lin dressed up as Elvis for comedian/musician Rev. Billy C. Wirtz and Sister Judy’s wedding at the Memphis Botanical Gardens. They are divorced now (not Lin’s fault). Lin has also appeared in Metropolis as “Jor-Elvis”. Lin is an Honorary Citizen of Metropolis, IL (2009) and occasionally wears his red underwear on the outside of his pants while in Metropolis. Lin has received Christmas cards from Noel Neill (original Lois Lane). Lin has judged costume contests with comic artist Murphy Anderson and writer Marv Wolfman, gone bowling with Wolverine/Swamp Thing co-creator Len Wein and on a ghost tour with comics writer Gail Simone. The first comic Lin ever read was Marvel Team-Up #4 (Spidey/X-Men). The first comic he ever bought was Amazing Spiderman #171 (Spidey/Nova). Both issues were the second part of two part stories. Again, Lin was a wee bit late. The first art book was “How To Draw Comics The Marvel Way” and received a rejection letter from Marvel a few years later when he was in high school. He hopes to submit to Marvel again some day. Lin came up with the “Bushi Tales” comic series (with David Beaty) while riding around Memphis in the mid-90’s in his ’73 SuperBeetle (which thankfully had a busted radio). 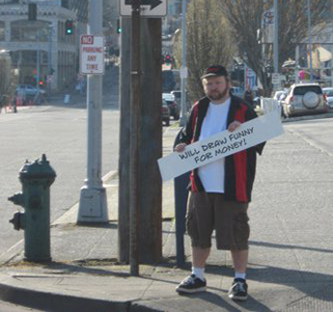 He regrets selling that car to this day. He has taken many martial arts, but is a master of none. He has performed as one half of the Memphis Blues Brothers – Linwood and Soloman Blues with Kevin L. Williams (twice for charity in front of Isaac Hayes and once in a lesbian bar just for fun), and has met Dan Aykroyd and Jim Belushi. He is also in the special features section of the 25 anniversary edition DVD of The Blues Brothers movie (mug shot cover). Lin loves to do voice impressions, but isn’t going professional with it any time soon. Lin can juggle and stilt walk (and run, much to his wife’s discomfort), but isn’t up to doing both at the same time or using chainsaws yet. The first haunt he ever volunteered for was held in the basement of a Mormon church in Utah. Lin draws/paints left-handed outside the computer, and right-handed inside the computer. He can use chopsticks with either hand, but he hasn’t quite got the hang of using them with his feet yet. He eats ketchup on just about anything and thinks A&W draft root beer in a frosted mug is da’ bomb. Lin is related to actor/Football Hall of Fame’s Merlin Olsen (cousins on father’s side). Lin is not athletic, but he has run up the stairs of the Philadelphia Museum of Art (twice), done the “Rocky pose”, and followed it up both times by eating a large Philly Cheesesteak (with Cheez Whiz- Mmmmm…). He collects Batmobile toy cars (and most anything Batman). His dream is to own a real Batmobile when he grows up. Lin sold worms (nightcrawlers) as a kid. Also shoveled snow, cleaned parking lots, mowed yards, and delivered groceries to support his comics and junk food habits growing up. His favorite sports teams are the New York Yankees, St. Louis Rams, Nashville Predators, and Mississippi Riverkings. Lin played for the Yankees in the second and third grades (ok, it was little league). Lin’s hero as a kid was Evel Knievel and growing up Lin rode an Evel Knievel bike. Lin once built a ramp in the driveway before watching the George Hamilton “Evel Knievel” movie and forgot about that ramp until his dad backed the family car over it the next morning. His dad didn’t make the jump, but Lin survived the stunt. Lin’s parents never bought him a motorcycle. Lin’s favorite bands are KISS (yes, Lin has worn make-up and high heels to a KISS concert) and Saliva (M-town represent!). Paper or plastic – has been known to go both ways.